Happy June MBT friends! Hope your day started with good vibes! I got these L'Oreal nail paints along with the #BoldInGold collection but I completely forgot to review them! I had already reviewed an eye shadow palette and lipsticks from this collection! The nail polishes are a bit pricey but the quality and colors are totally worth it! L'Oreal Nail Paints* cost Rs 399 for 13.5 ml! BUY ONLINE Violet Vendome/ BUY ONLINE Coral Trianon! The packaging of the nail polishes is really pretty with checkered patterns on them! The golden lid makes the packaging all the more elegant! The brush is of very good quality and applies nail polish without streaks! Violet Vendme is a super chic dark violet color with a creamy finish! Coral Trianon is a soft coral color with a creamy finish! Both the nail polishes have really good, creamy formula and superb pigmentation. As Violet Vendome is a dark shade, I apply a base coat underneath to avoid staining my nails! The staying power is pretty good too! The nail polishes last for a good 5-6 days without chipping with a top coat on! - The nail polishes have a blend of precious oils and intense color pigments for pigmented colors! L'Oreal L'huile Nail Paints are good quality, highly pigmented nail polishes with a wide range of colors! Highly recommended! 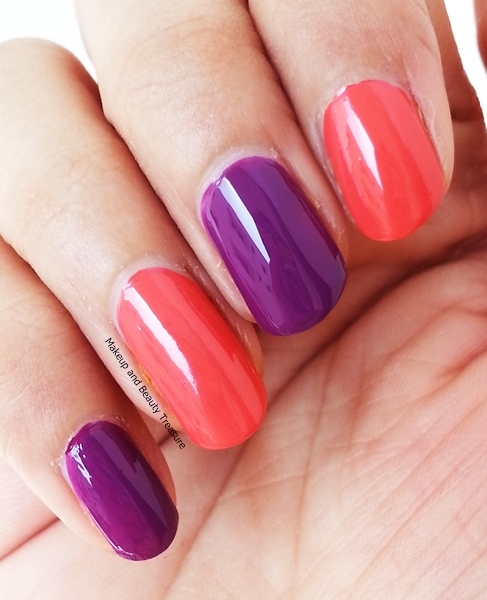 - Apply a top coat to make it last longer. 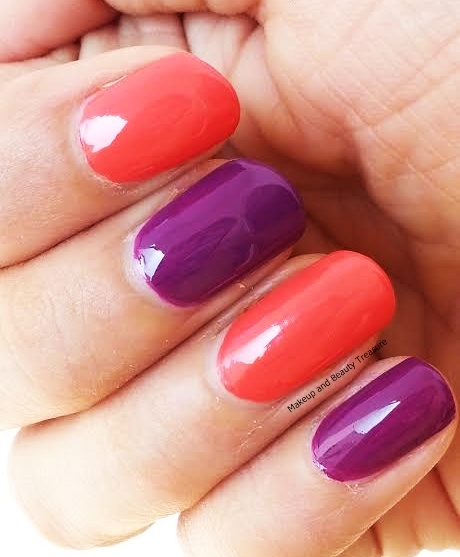 Hi Megha, I love your nail colors: they are perfect for summer! Sorry, ignore the link, I didn't wanted to put it but I made a mistake. Anyways this nail polish is one of my favourite. I Have never tried nail paints from loreal . Do try. They have amazing formula and shade range!